Apollo's Hegemony Rhodiola is a natural dietary supplement containing the roots of Rhodiola Rosea, standardized for the content of 3% salidrosides. Adaptogenic properties and the activity decreasing fatigue and exhaustion are its main features, which make this preparation infallible in the periods of exposure to long-lasting stress and exhaustion. Adaptogens are substances of plant origin, which support maintaining homeostasis and proper course of physiological processes, in a natural way increasing the organism’s immunity to stressors of various origin. Thanks to their application, we improve our ability to adopt to overload and changeable environmental conditions. - minimal risk of undesirable effects and changes in the organism’s physiology, resulting from their application. Adaptogens find application both in the situations of exposure to stress factors and as a prophylactic measure. An indisputable advantage of their application is the fact that they not only help to get rid of the ailments, but also strengthen the whole organism. Rhodiola Rosea is a herb used for ages is traditional medicine. It owes its name to a specific smell of rhizomes and rose color. It is commonly known as Golden Root or Arctic Root. Thanks to the richness of bioactive compounds contained in this plant, it is primarily used in order to increase vitality, life energy and for general support. It was proven that this plant may positively influence cognitive abilities at the moment of their deterioration and the reduction of physical and mental fatigue resulting from stress. Numerous studies show that a range of substances are responsible for the positive properties of Rhodiola Rosea, which include polyphenol compounds, i.e. phenylpropanoids, flavonoids, proanthocyanidins and tannins. So far, the largest role was attributed to rosavins, belonging to the group of phenylpropanoids. This caused that the majority of preparations present on the market contain the extract standardized for the content of these compounds. However, it turns our that for adaptogen, antidepressant and anxiolytic properties of Rhodiola, mainly salidrosides are responsible, which are derivatives of phenylethanol, the biological activity of which may considerably exceed the activity of rosavins. It was proven in one of the studies that salidrosides were distinguished by antidepressant effect, while rosavins turned out to be inactive ingredients of the extract. Apollo's Hegemony Rhodiola is one of very few preparations available on the market, standardized for such a high content of salidrosides. Stressors are internal or external stimuli or events, which cause stress and are unfortunately present in almost each area of our lives. Work, home, school, pace of life and the excess of duties often cause mental and physical exhaustion, leading to the organism’s overload. Stress factors may be divided into chronobiological, physical, mental and sociological. The organism’s burden resulting from the activity of chronobiological factors is primarily day-night rhythm disorders, caused by improper time of falling asleep, excessively short time of sleep or its fragmentation. Unfortunately, current times are full of appliances that emit light, sound and noise, which make us prone to the constant influence of audio, visual and chemical stimuli, bombarding at the same time our nervous system. These factors belong to physical dangers. Mental factors causing stress are all kinds of burdens, challenges and daily problems, which are an indispensable element of our life. In the era of information technologies, we have troubles maintaining healthy interpersonal relations, which belong to sociological stressors. It is believed that Rhodiola Rosea decreases the symptoms of stress by maintaining balance in the nervous system, composed of the parasympathetic element (rest, regeneration) and sympathetic element (fight, flight, action). Adaptogen properties and increasing tolerance to stress are attributed to the influence of the secretion of serotonin and opioid peptides (β-endorphins), which are responsible for well-being. Long-lasting influence of stress on the human organism decreases its intellectual efficiency and may, among others, cause anxiety states, insomnia, irritation, lack of motivation to act. The exposure to long-lasting activity of stress factors also increases probability of the development of many diseases (infections, heart and circulatory system diseases, cancers, autoimmune diseases, depression). Scientific research indicates that the increased risk of their occurrence is related to weakening of the immune system. Constant production of cortisol contributes to the decrease of the amount of leukocytes and the ability of the organism to produce antibodies. Rhodiola rosea, thanks to its possible adaptogen activity and the properties alleviating stress, contributes to decreasing the risk of the above mentioned side-effects of chronic stress. Thanks to its normalizing properties, it supports regaining the state of homeostasis and facilitates adaptive mechanisms of our organism. It was proven that Rhodiola rosea demonstrates moderate stimulating properties. It was observed that supplementation with the preparation containing the extract from the root of Rhodiola rosea contributes to the improvement of psychomotor abilities, improvement of memory and concentration and decreasing the feeling of fatigue in people subjected to the activity of various stress factors. Antioxidants decrease the activity of reactive oxygen species, which may contribute to the prevention of certain civilization diseases and positive influence on the organism’s health. Numerous studies show that antioxidant effects resulting from supplementation with Rhodiola rosea are reflected in many health benefits, to which may classify: decreased pace of bone mass loss, cardioprotective and neuroprotective properties resulting from decreased number of damages and lower amount of biomarkers testifying to the destruction of muscle cells related to physical effort. 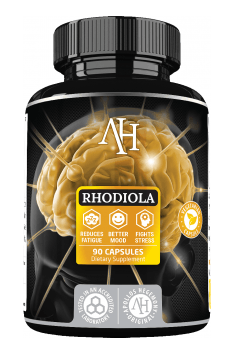 To sum up, Apollo's Hegemony Rhodiola is a dietary supplement, which is worth using before we expose our organism to the activity of stress factors, minimizing their harmful influence. Unfortunately, not all situations may be predicted, however, we have a good piece of news - this preparation works well also during exposure to stress and physical or mental effort, naturally and safely supporting defense and adaptive mechanisms of the organism. Moreover, it may be used by people who lead an irregular lifestyle, caused by problems with sleep or specific type of work (drivers, shift work, security work). In each situation, when our organism is exposed to difficulties, we need to remember that problems and obstacles are an indispensable part of our life, therefore it is worth considering including adaptogens, such as Rhodiola rosea to constant supplementation. Mam szacunek do Rhodiolki. Ostatnio od rana miałem dwie ważne rozmowy telefoniczne, jak byłem zaspany i przygaszony, tak po 2 kapsach z godzinnym odstępie czasowym (NA CZCZO) byłem taki "do przodu", gadatliwy, pewny swoich myśli, ale na spokojnie - bez nadmiernego pobudzenia. Na pewno działa delikatnie antydepresyjnie, czuć tą "chęć". Wcześniej brałem z doskoku 1 kaps. rano i nie widziałem wielkich różnic, więc czas włączyć regularność i dać jej czas na działanie. Rhodiola is widely considered to be safe and well tolerated, but in large doses (1,5-2g/day) it can cause hyperactivity. Rhodiola extract can be mildly energizing, so it should be used in the morning and afternoon hours. It's best to use it in the morning on an empty stomach or between meals. The effect on pregnant and nursing women has not been tested yet, so it shouldn't be used by them until there is more information available regarding this. Bulking substance - Rice flour; Hypromellose (vege capsule). Patented form of vitamin C in liquid. A vitamin-mineral complex with very good absorption. Recommended for athletes. Rose root - (Rhodiola rosea) - due to the use in Oriental medicine, the root is also known as Golden Root. The use of preparation improves psychophysical capacity, reduces fatigue, improves mood, relieves stress and depression. It includes a variety of biologically active ingredients, such as flavonoids, polyphenols, tannins and proanthocyanidins. In the sports supplementation extracts from the golden root are used in the period of intensive training in order to improve the resistance to overload, in cases of stress overload, for improving the well-being and accelerate post-workout recovery time. The root of Rhodiola rosea is available as mono-preparation supplements and it is a component of supplements of versatile action. In clinical trials, in the treatment of moderate depression, a dose of 380-680mg / 24h was administered, without side effects.